Seeds or Seedlings? Ideas to Get Your Vegetable Garden Going - Columbia Builders, Inc. Depending on the type of vegetables you want to grow in your garden, you may have to plant a mixture of seeds and seedlings. With the start of spring next week, local garden centers will begin to stock young plants in the coming weeks. If you’ve always wanted a garden in your custom home’s backyard, but you’re unsure how to start, you may find these seedlings irresistible. However, it’s important to approach garden planning with the right information so it can blossom and thrive. After deciding which herbs and vegetables you want to grow in your garden, you have two options – buying seedlings and planting them, or planting seeds and growing them from scratch. Let’s take a look at each option carefully. In cooler climates such as the Mid-Atlantic region, some vegetables such as tomatoes and cucumbers need to start growing indoors and then be transferred outside. 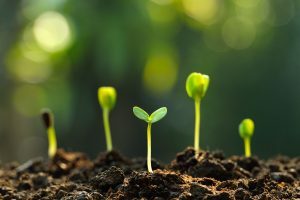 This technique can prove difficult; many homeowners without gardening experience should opt to purchase mature seedlings in order to grow these types of vegetables. In addition, perennial herbs – such as rosemary – take a long time to establish, making it worthwhile to purchase seedlings in this instance as well. Choose a reputable nursery when shopping for your plants, select ones with strong leaves and a bushy growth pattern, and ask the staff questions – including when you may plant your seedlings outside and how to protect them if a late frost strikes. Be sure to transplant your seedlings either in the early evening or in the morning to avoid plant stress from the mid-day sun. Vegetables such as corn, peas, lettuce, carrots, and beans grow more quickly from seed and can be damaged easily during transplanting. For these, planting seeds is your best bet. Simply follow the instructions on the seed packet and keep the soil watered evenly until the plants start sprouting. As soon as the first adult leaves appear, you’ll need to prune the plants and pull out any seedlings that may have grown too close together so that the plants have ample space for growth. This entry was posted on Friday, March 16th, 2018 at 9:29 am. Both comments and pings are currently closed.